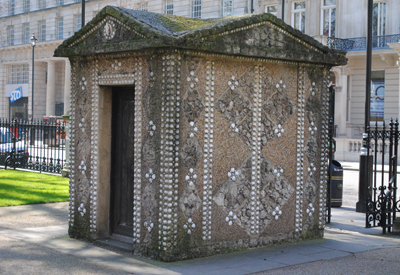 This gardener’s lodge, featuring embedded sea-shells, is located in Lower Grosvenor Garden in Victoria. It’s one of a pair given by the French Government and, like its twin, was placed in the gardens in 1952 when they were remodelled in formal French style – including paths laid out in the design of a fleur-de-lis – in honour of Anglo-French cooperation in both world wars. The gardens were designed by French architect Jean-Charles Moreux and some of the shells were apparently brought over from France. In keeping with the French theme, the gardens also feature an equestrian statue of World War I figure, Marshal Ferdinand Foch, placed there in 1930.